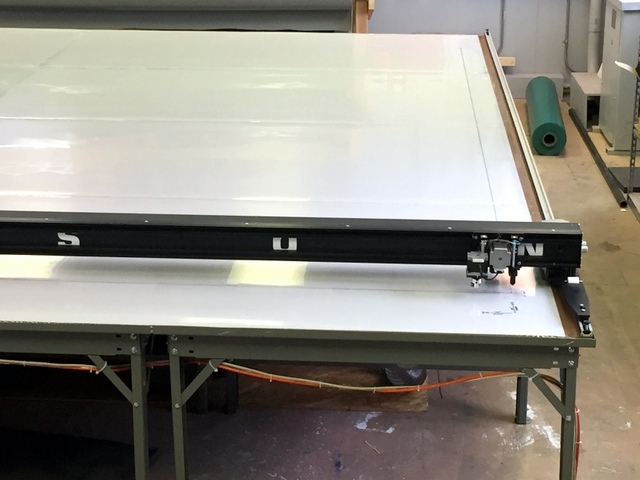 WT-174″ Plotter/Cutter on a 14.5×16′ long Phillocraft vacuum table. Steve to Paul: “That would have taken you half a day!” referring to a 4 minute cut. 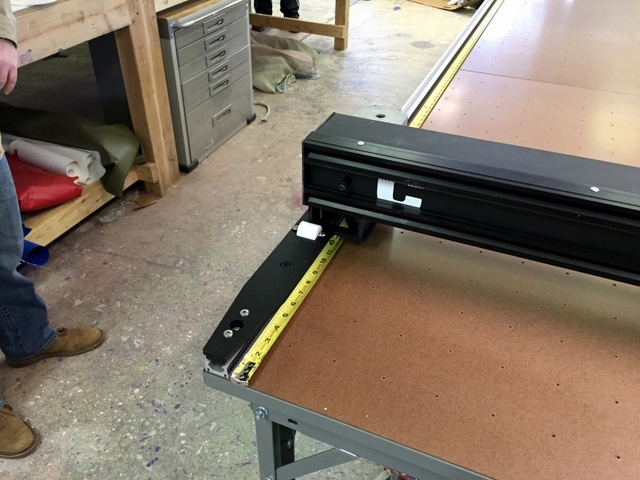 “They fit perfect” – checking the first cuts. 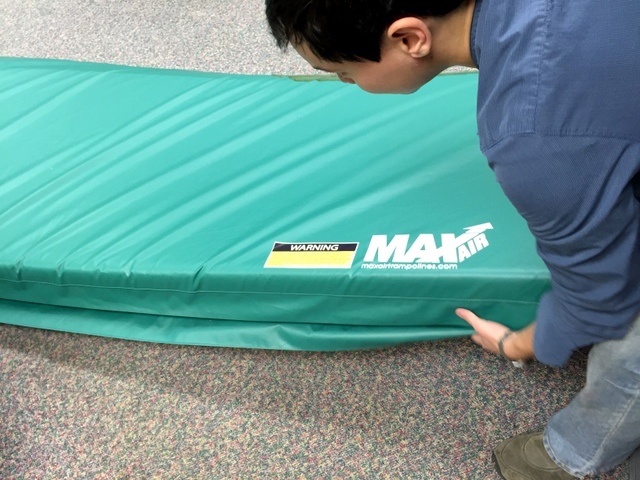 President of Maxair Trampolines, Paul Hagan, has been making trampolines for over 30 years — making his first trampoline in High School metal shop class in 1979. Paul found the guarded and comptetive nature of the trampoline industry left him few options for getting help to source and design the ultimate high-bounce super-tramp. 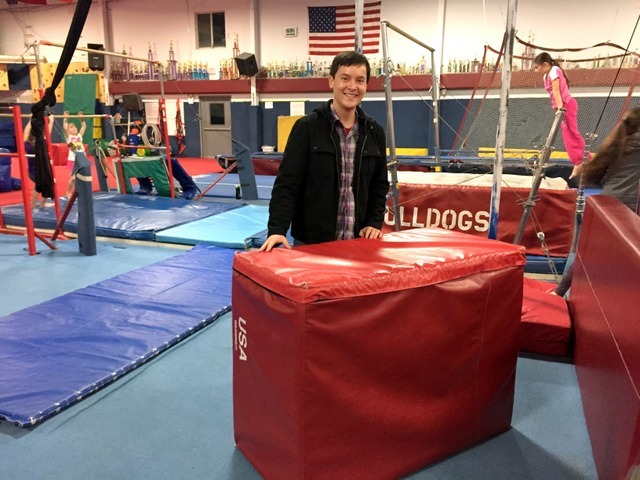 In order to create a trampoline extreme athletes could use to work on their off-axis aerial maneuvers he had to design, build, and weave his own trampolines. 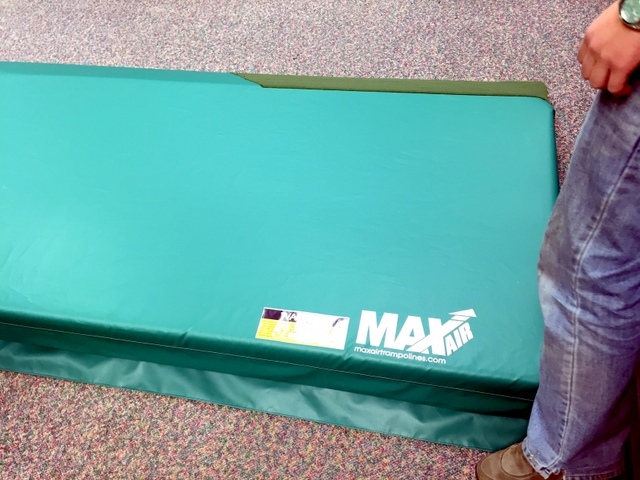 In 2010 Maxair debuted their 14’x14′ Super Quad trampoline which was an immediate success. 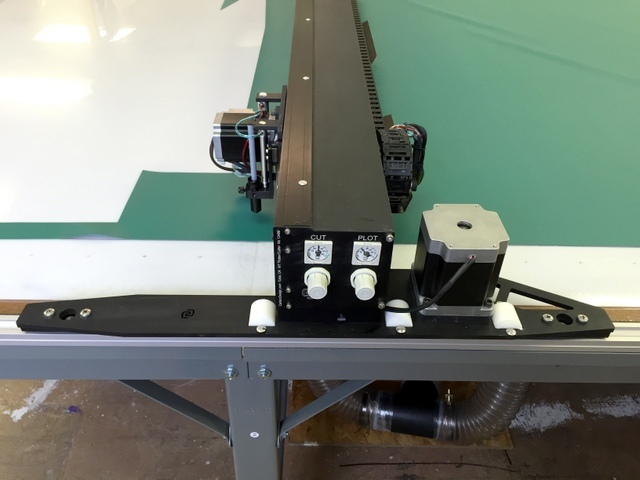 To meet the market’s demand for their high bounce tramps Paul has decided to automate the marking and cutting of their trampolines, pads, and stencils using a Carlson WT-174″ Plotter/Cutter on a 14.5’x16′ Phillocraft vacuum table. 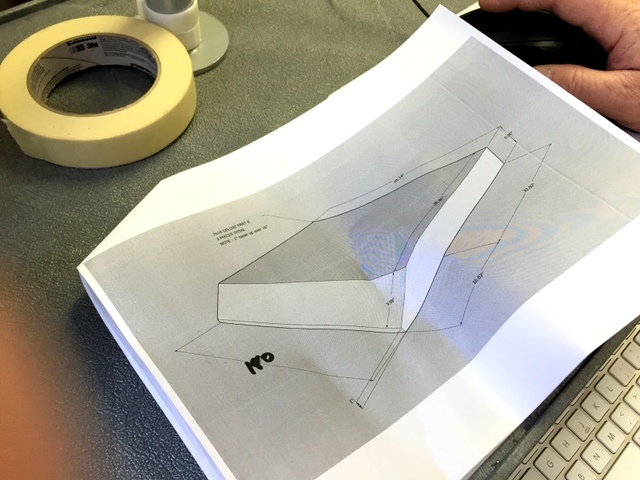 Steve Chan, part owner of Maxair, draws Paul’s trampoline and gymnastic pad designs in Sketchup. 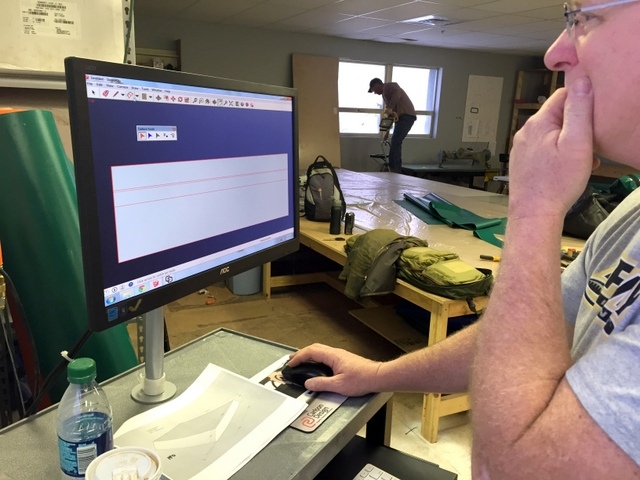 Using the Carlson Sketchup plugin –which allows you to quickly draw plot and cut lines and export ready-to-cut 2D patterns — they plan to draw 50 new pad designs in 2015. During our installation we worked closely with Paul and Steve to help them automate existing patterns and help them design several new ones. These guys are in for a big year! Steve checking out pads at the gym. Designing and digitizing existing pads. Below we will walk you through the details of their ultra-wide system, its setup, their time and material savings, and the different projects they cut using their new ultra-wide Carlson cutting system. At the end we’ll show a step-by-step picture guide to the installation. 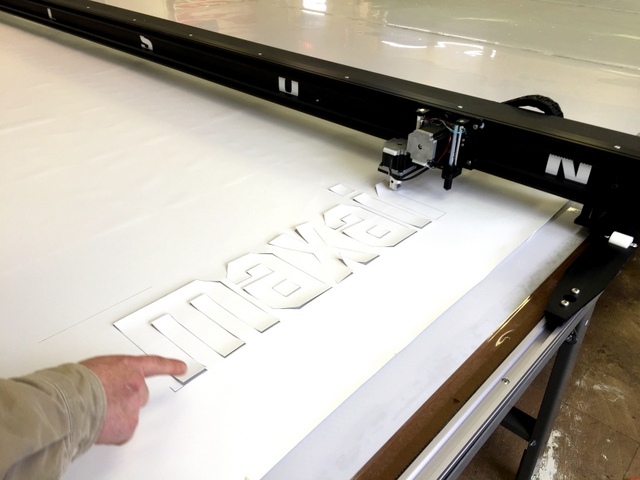 At 174″ wide MaxAir’s WT-174″ Plotter/Cutter is the widest system in North America (for now!). This system is identical to the one installed at byDESIGN in Nairobi, Kenya and 2″ wider than the 172″ wide system we installed at Ulster PVC in Northern Ireland. 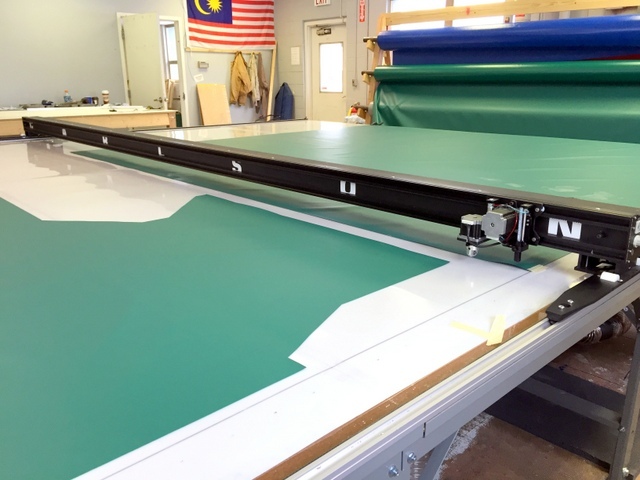 The WT is designed specifically for cutting ultra-wide fabrics and is capable of plotting/cutting up to 159″ wide material. To accommodate the added loads associated with ultra-wide systems the WT has 4X larger X motors, 2X larger steered cutting motor, X drive load wheels to extend trolley life, and stretched drive plates to ensure the machine cannot rack out-of-square. All of the internal components are over spec’d and housed on a removable cassette that slides out of the right side of the machine. 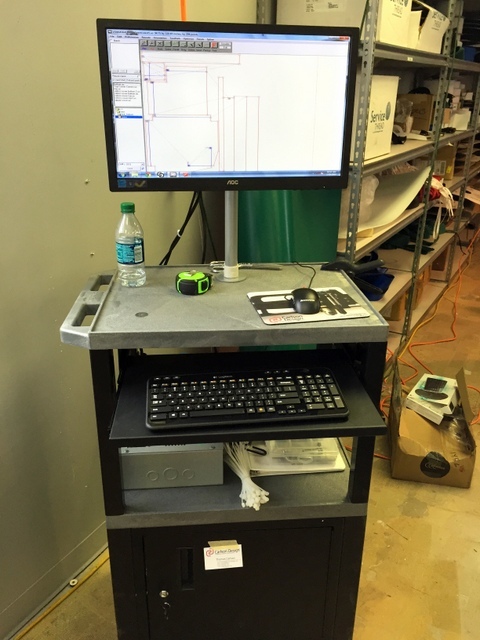 This allows for easy service and maintenance without needing to remove the system from the table. To reduce weight the power-supply lives off board. 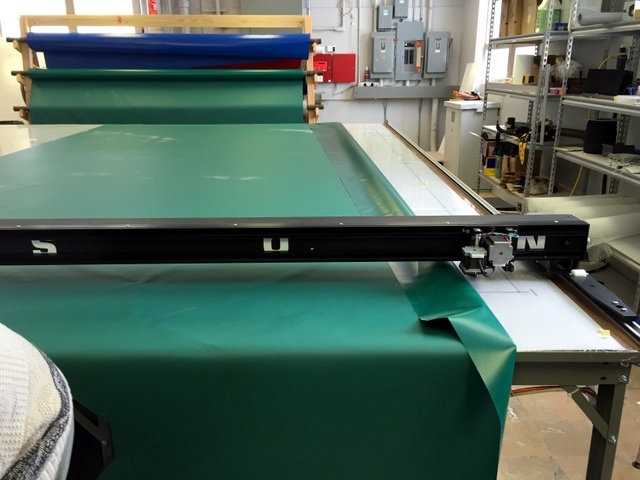 At 174″ Wide they can plot/cut up to 159″ Wide material. The 4″x4″ Composite aluminum box-beam frame is extremely rigid. 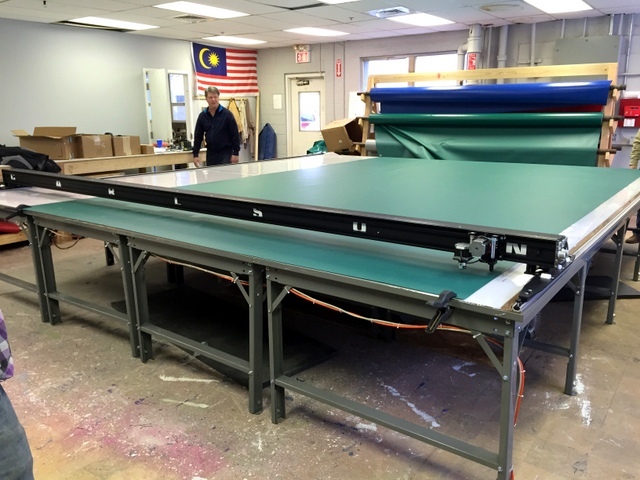 The 27″ Stretched X drive plates ensure the machine stays very square on the table. The 1800 oz stepper motors are 4x larger than our standard Pro PT — these help account for the added weight of the wide gantry. 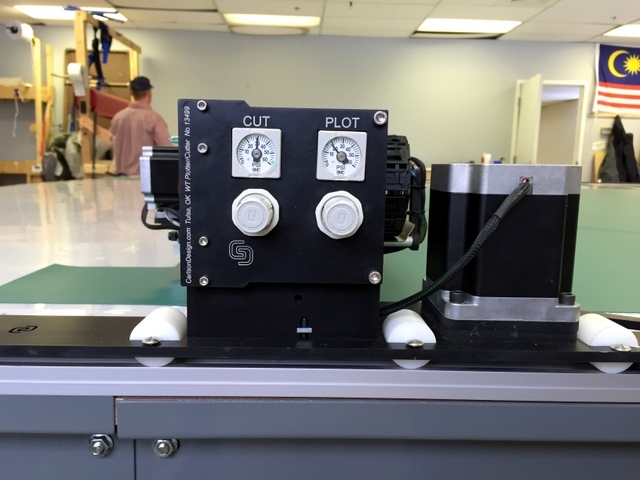 Easy to access on-board pneumatic controls. Laser etched end-caps are simple and beautiful. The WT’s Z motor is 2x larger than our Pro PT’s. 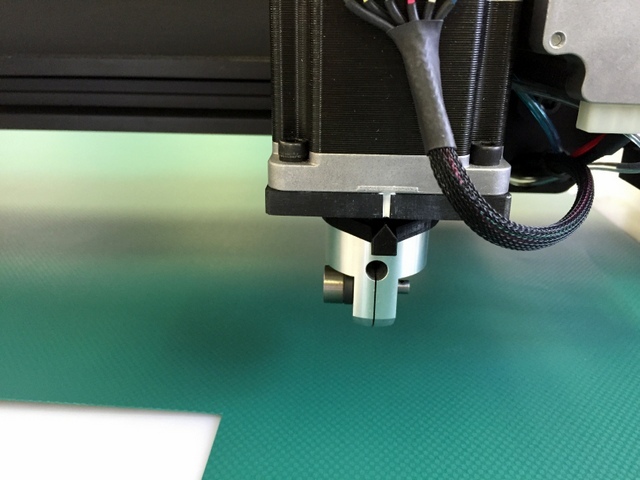 The cutter alignment indicator is custom 3D printed for this ultra-wide setup. Three Delrin load wheels on each drive plate help support the added weight of the ultra-wide system, extending the life of the trolleys. All of the WT’s electronics are contained on a single cassette that slides in-and-out of the right side of the machine. This means the system can be serviced without removing the machine from the track. 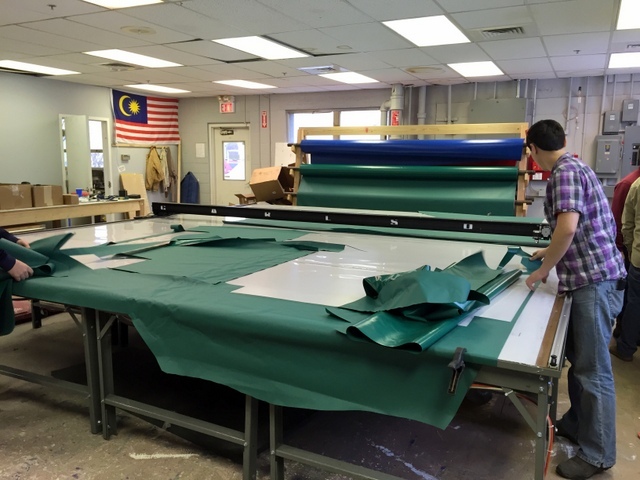 They chose to get a our 14.5′ wide system to cut their wider PVC fabrics and mesh materials. 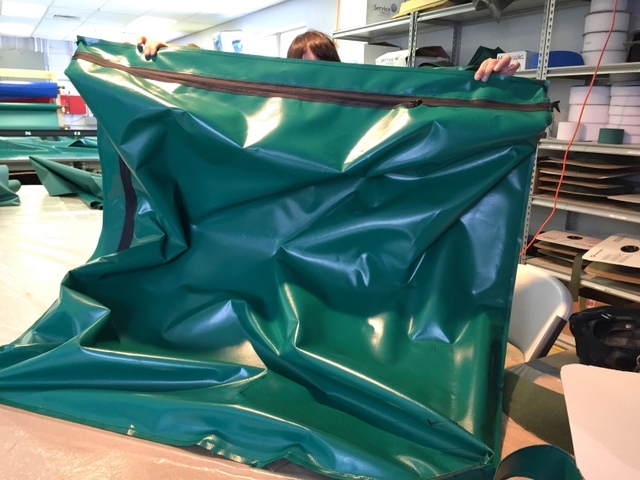 Cutting their patterns out of wide PVC allows them to make gymnasium pads with fewer seams and cuts. 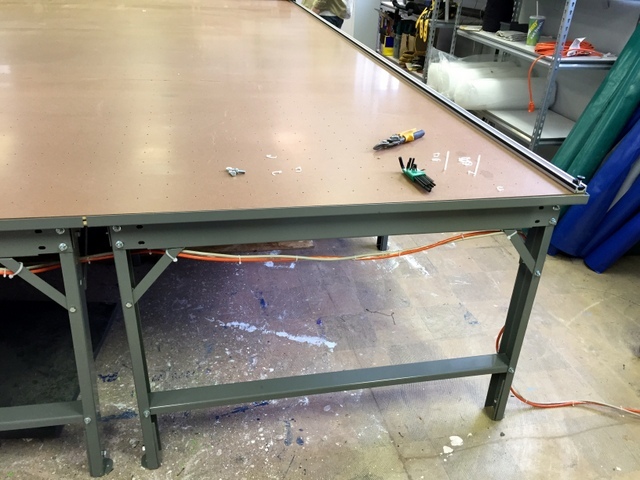 Their shop space dictated the length of the table to only 16′. 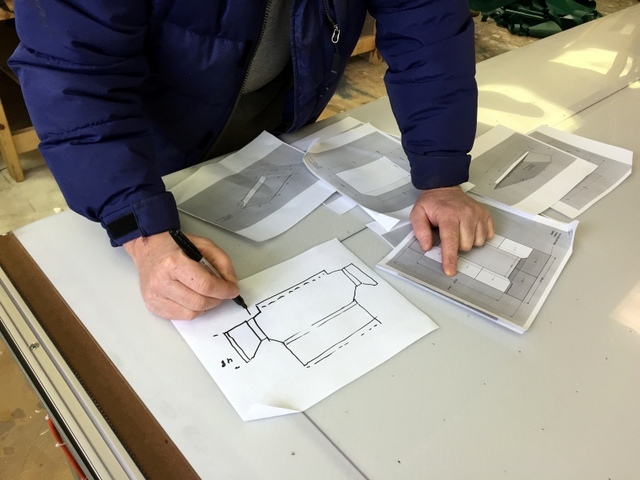 Having just expanded their sewing department they were hesitant to fill it with a 40′ long table, deciding instead to get a shorter table that was more affordable and uses less real estate. 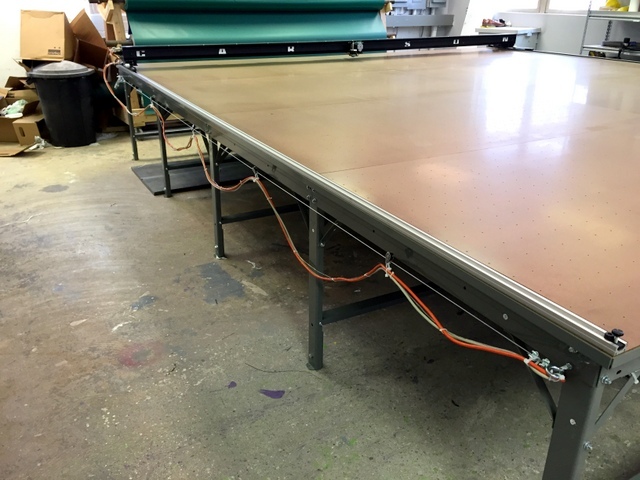 As the grow production, our endless-frame Phillocraft vacuum tables can are easily expanded. Something they are already planning to do! In the meantime, we use our virtual table software to help them break long patterns into smaller parts. 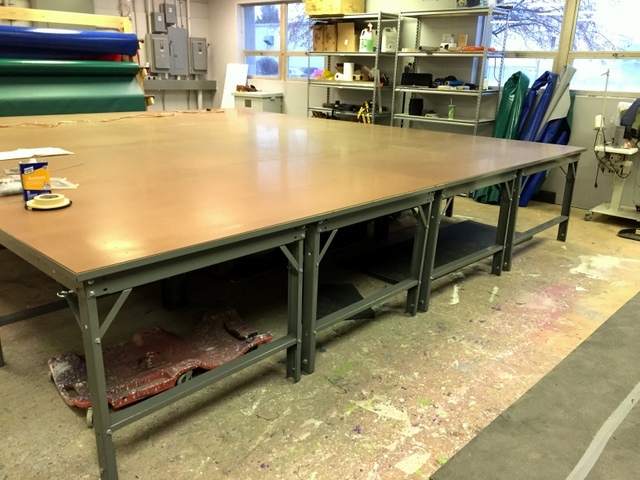 14.5′ wide steel frame table. Our Phillocraft steel frame tables are availble in any width in 6″ increments. The table sections come in endless 4′ long lengths. 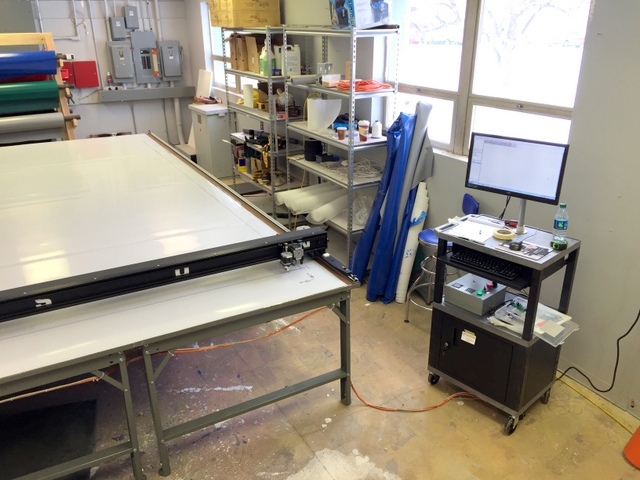 WT-174″ Plotter/Cutter with operator’s workstation and monitor. This cart has a locking box for securing the computer and accessories. 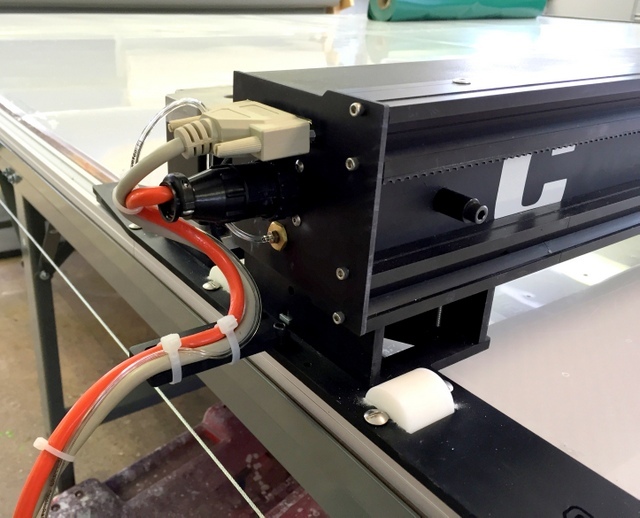 Let’s look at some of the projects they cut using their WT-174″ Plotter/Cutter! Their first cut took an hour to draw in Sketchup and then four minutes to plot and cut. That’s amazing — previously it took nine hours to cut two pads by hand. Now that this pad is designed every future pad takes only 4 minutes to plot/cut! That includes NOT needing to climb all over the table. Project 1: Making this pad. Here’s the finished product. 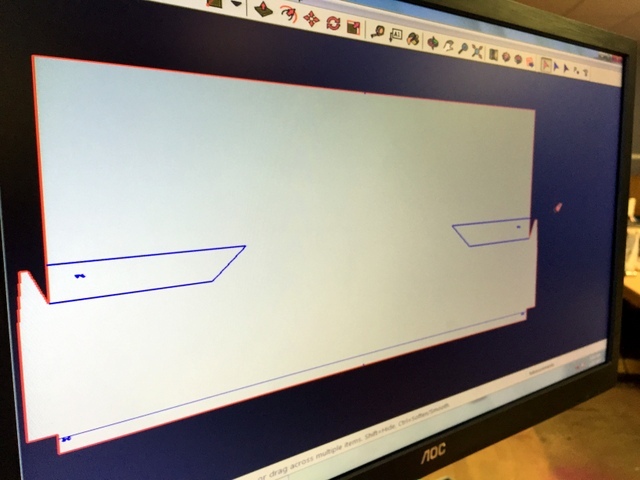 With Paul’s industry knowledge and Steve’s sketchup skills they can quickly draw their patterns in Sketchup. Paul is drawing a 3D design in 2D. 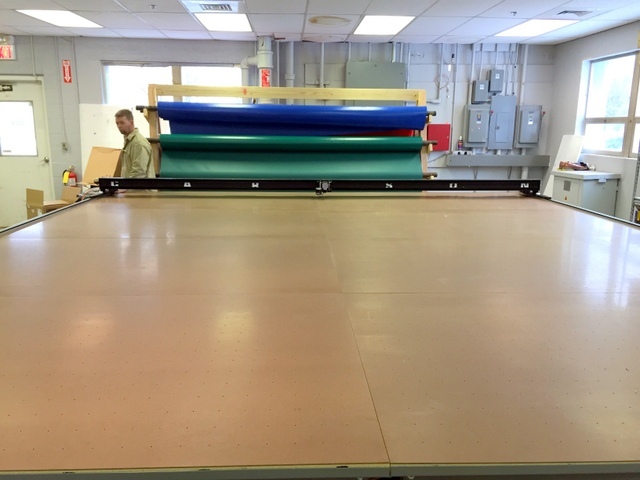 This pad is designed specifically to be cut out of 126″ wide material. It includes plot line (blue) and cut lines (red). 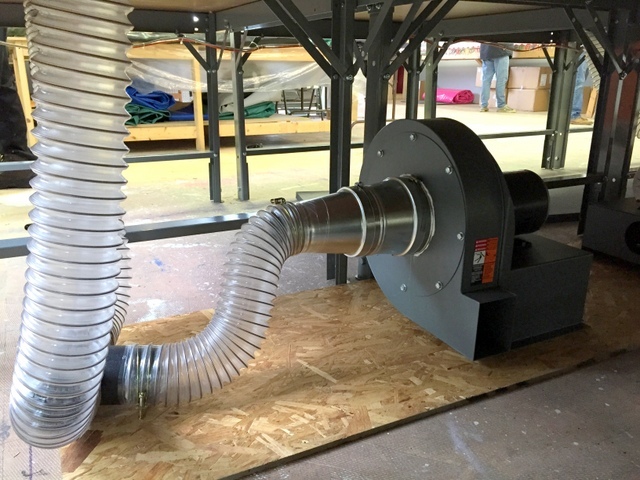 Once designed, spread your material, align on the table, and (once installed) turn on the vacuum blowers. This is our first cut at Maxair Trampolines. 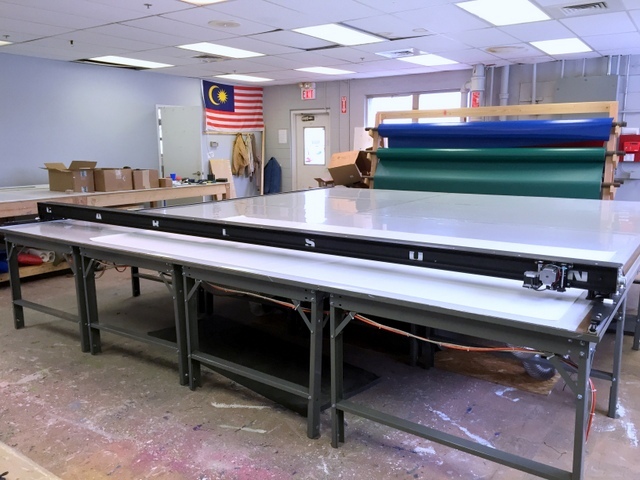 They are using our WT-174″ Plotter/Cutter on a 14.5’x16′ long vacuum table to cut 18oz PVC with a 28mm steel rolling blade. Their electrician is still wiring the blowers, so this cut is WITHOUT the vacuum turned on. These parts were designed in Sketchup, nested in Plotmaster, and then plot/cut in less than 4 minutes. Listen at the end of the video — you can hear Steve declare, “That was lightening fast” and “That would have taken me half a day”. Not bad for our first cut! Before starting your first cut, be sure to gather a big crowd! 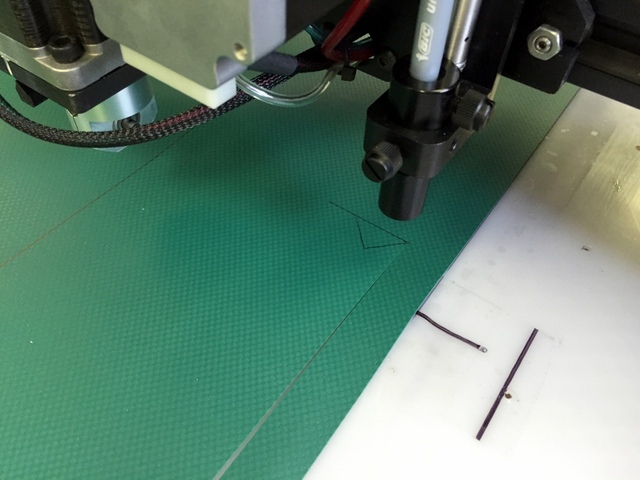 Successful cut your newly designed pattern in under 4 minutes. It’s important early in the training process that you sew and check your cut pieces to make sure you are making good parts. 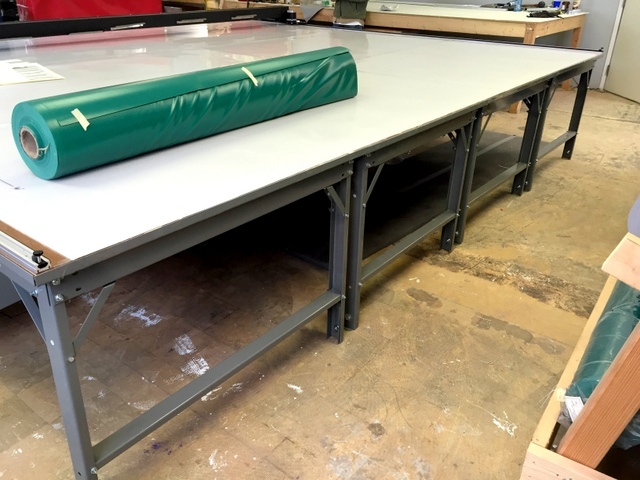 To save space and keep initial automation costs down MaxAir purchased only a 16′ long table to start. However, many of the initial gymnasium pads they would like to plot/cut are longer than their table. To handle these larger projects we use our virtual table software to split their patterns into multiple parts. Laying out their pattern that is larger than the table. 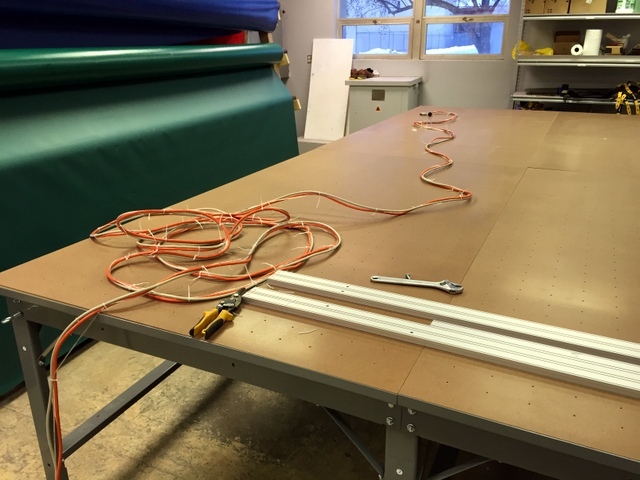 This next project — a 20′ long pattern, cut on a 16′ long table — normally takes half a day to cut each pattern. 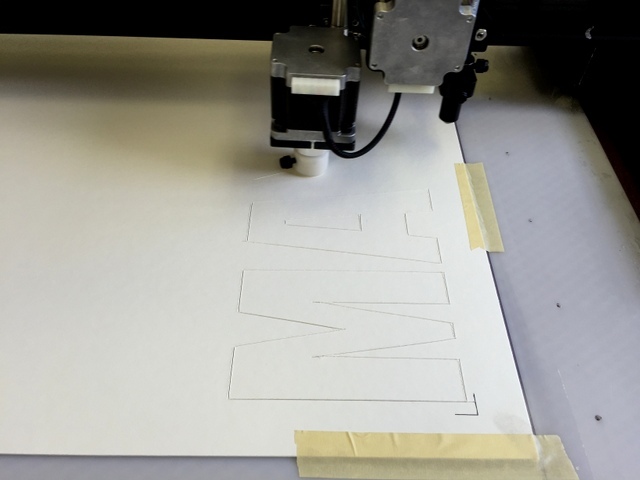 Using the plotter/cutter we are able to draw, plot, and cut the entire job in half an hour. That includes the time to design the pattern, cut the first one, modify it, and then cut another one! WOW THAT’S FAST! Watch this step-by-step, un-edited demonstration of how to cut a pattern longer than your table (~7min). Carlson Design’s Plotmaster software makes cutting long patterns into multiple parts quick and easy. To cut a virtual table: break your pattern into multiple parts using Pedit. Select your first part and plot/cut it. Advance your material. Align it with the table. Position the plotter/cutter on the alignment mark. Select the second part of your pattern and hit go! It’s that easy. This 20′ pattern is broken into 2 parts. Run part A. The WT makes clean and clear marks. At the end of part A the WT draws an alignment mark. 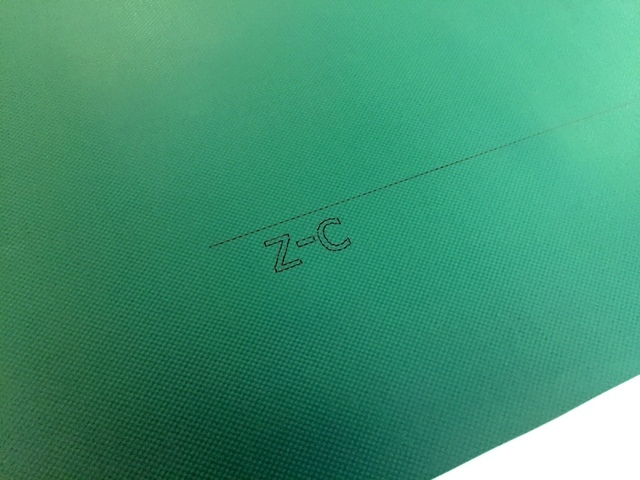 Advance your material and align the Plotter/Cutter’s pen holder with this alignment mark. Select pattern part B and hit go! The second half of the pattern is quickly marked and cut. Alignment is as accurate a you are. This is a picture how closely the lines in part A and part B align. Tolerance is +/- the width of a line. 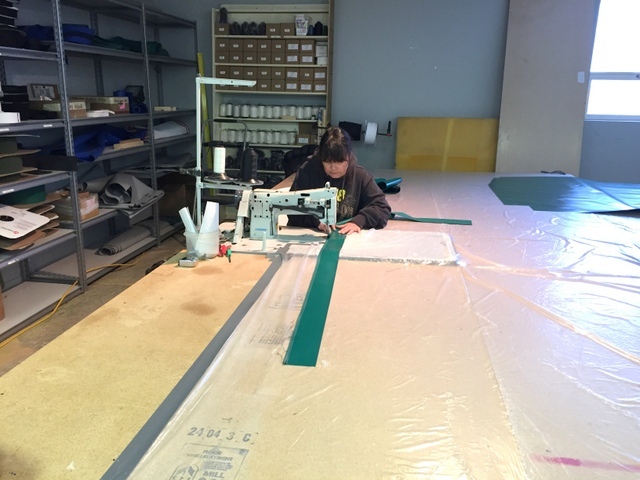 After they finish cutting this 20′ long pattern they need to plot a straight line 9″ from the edge on the backside of the fabric. 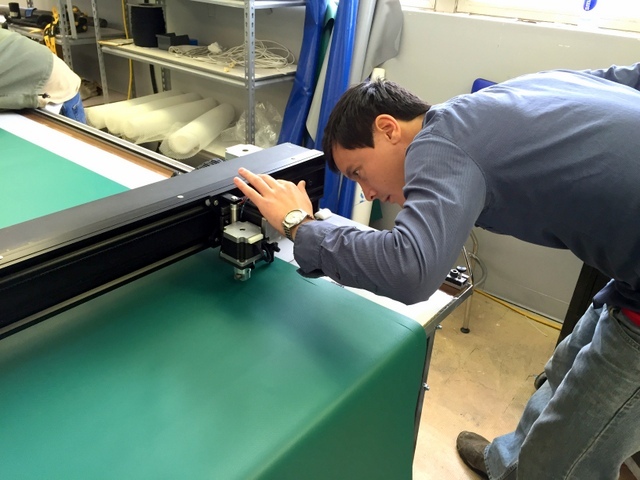 We show them how to flip, align their fabric, and use the plotter/cutter to mark the backside. Marking the backside of the material with the plotter/cutter. 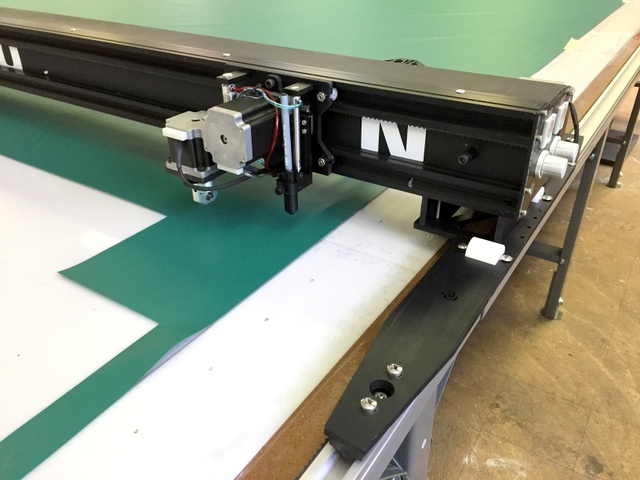 The WT-174″ Plotter/Cutter quickly and accurately cuts trampoline mesh with a 28mm steel rolling blade. 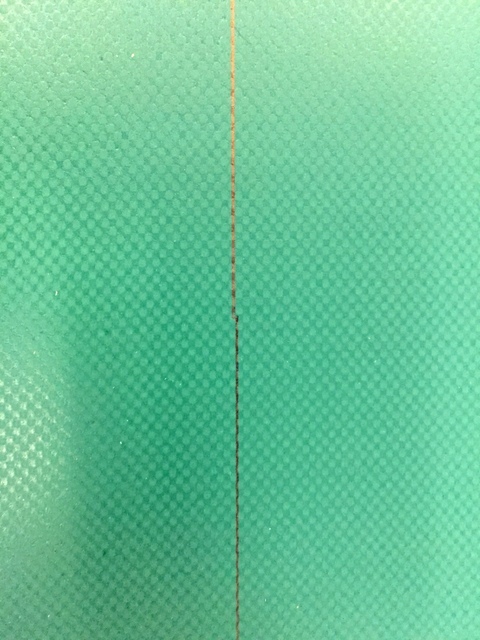 The weight of the mesh allows it to lay flat and NOT shift during the cut, even though we are not using any vacuum. Cutting the mesh for these style trampolines. 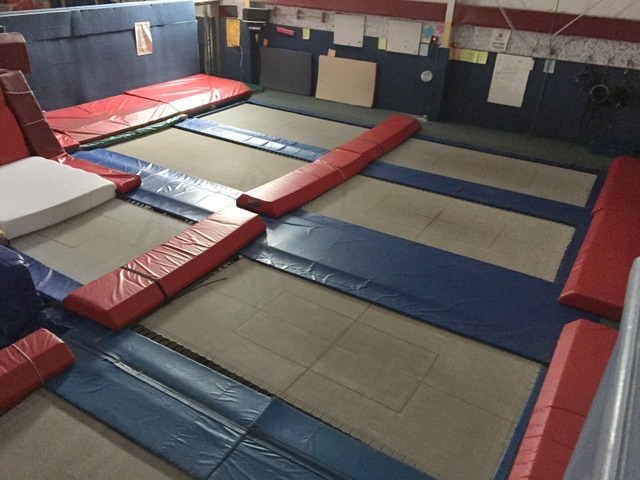 We visited the local trampoline gym Aerials and Baranis which features Maxair’s trampolines and a few of their competitors tramps. For fun Paul asked the five kids jumping which trampolines which tramps were their favorites. Without the kids knowing who made which tramp, 4 out of 5 picked a Maxair Trampolines. How about that review! 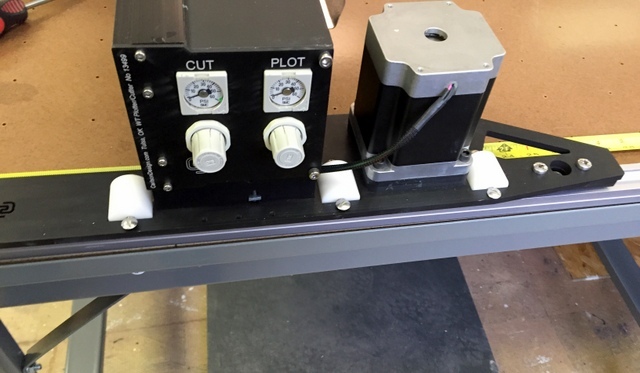 Here is a candid video of the Carlson WT-174″ Plotter/Cutter getting setup to cut two strips out of a piece of scrap material. Total cut time is less than 30 seconds. Total start to finish setup less than 2 minutes. Can you picture yourself working on a project like this? 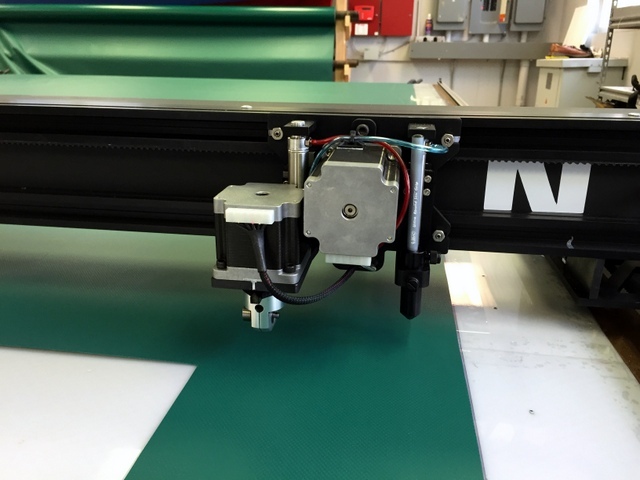 Maxair Trampolines is using their WT-174″ Plotter/Cutter to cut a stencil with our carbide drag blade holder. 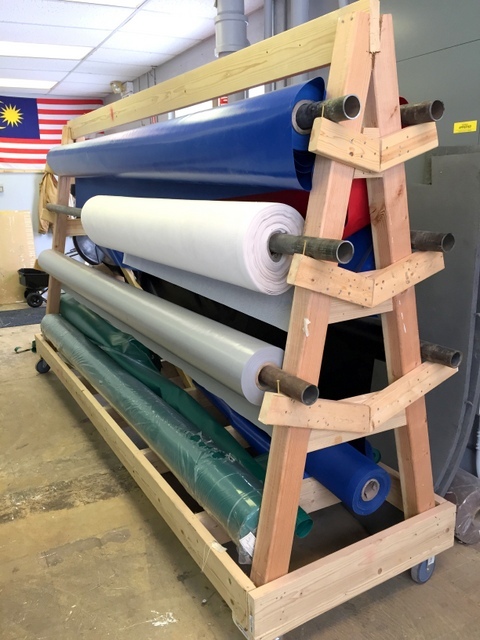 These will be used to paint customer logos on trampolines and mats. Cutting a stencil out of Chipboard. Cutting letters out of vinyl. Trying out a variety of materials to determine what cuts the best and paints the best. Now that we’ve seen several of their projects, let’s see how this ultra-wide system was installed. 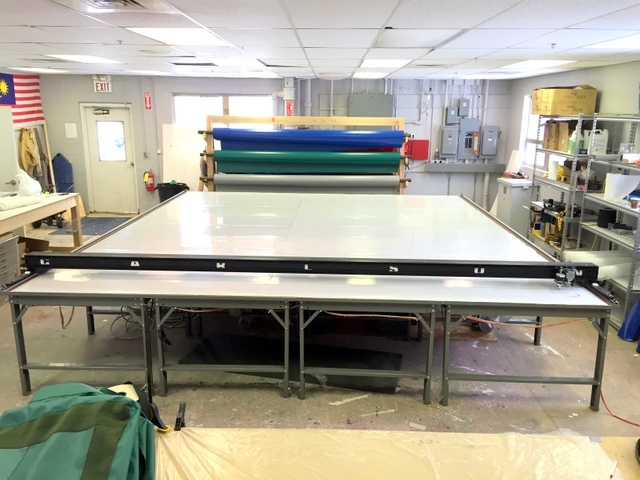 Setting up an ultra-wide system is a little more difficult than setting up our standard 6′ wide gantry, as the system is wider and heavier. However, with the help of Maxair’s team — Paul, Steve, and Jeff — we were able to setup their entire system by 2PM on the first day of the installation. 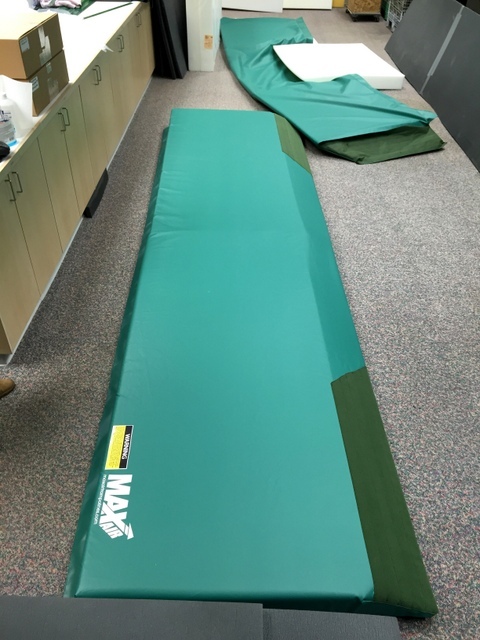 Below are pictures detailing their installation and how they helped get setup so quickly. 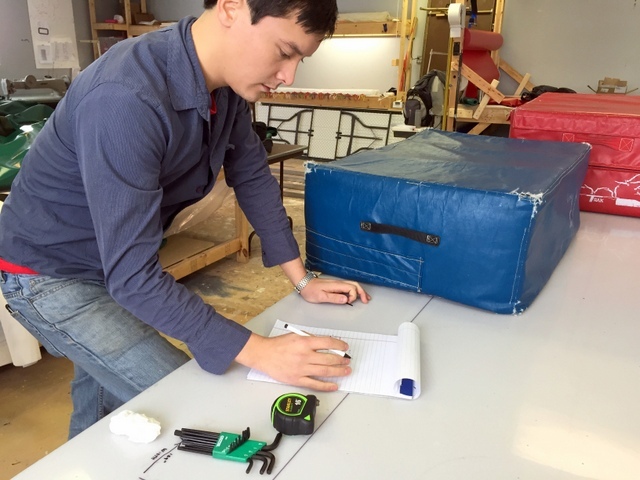 Our tables typically ship 2-3 weeks from when you place your order. 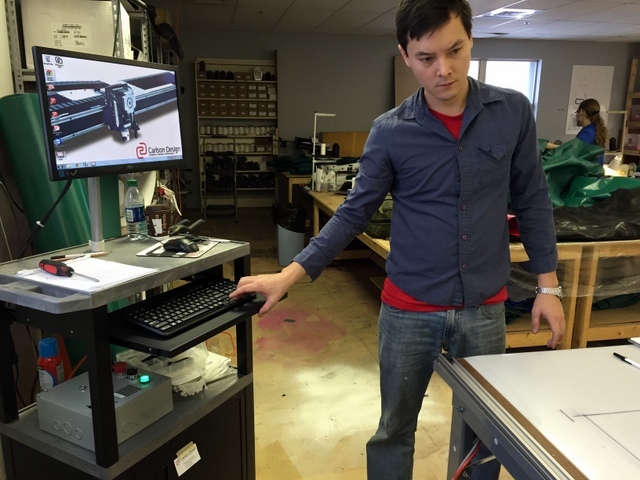 This means the table can typically arrive before the Plotter/Cutter. The tables are easy to assemble so they decided to setup their table before we arrived. The more you setup before we arrive, the more time we can spend on training! Layout the track and Loctite pins. Follow the track layout diagram in the manual. 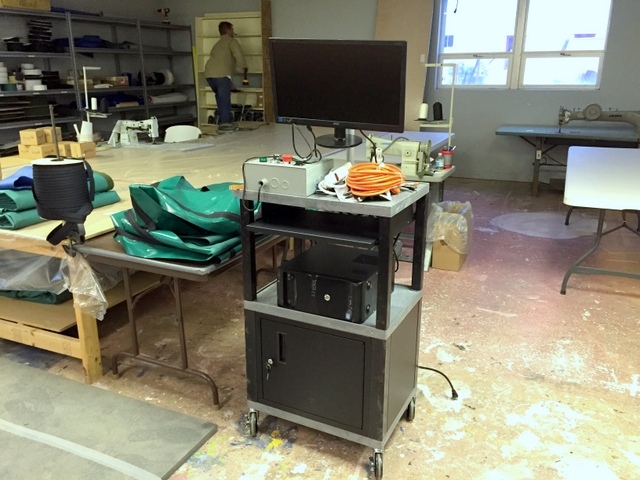 They opened and began assembling their operator’s workstation. Simple and detailed instructions help. Their vacuum table has four 3HP single phase blowers. 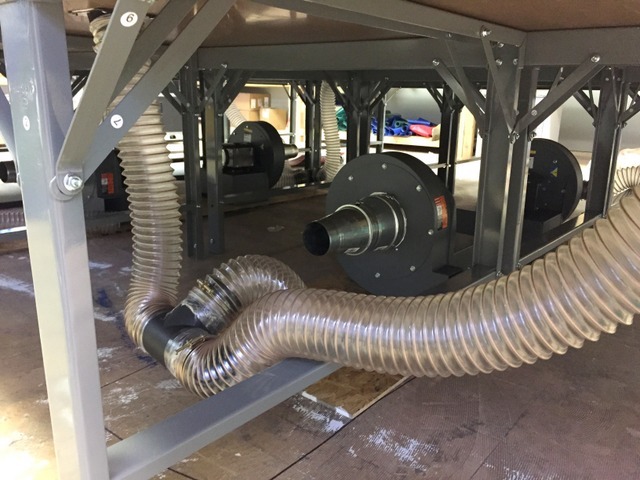 Each blower is plumbed to two table sections with flexible hosing to make the installation quick and easy. Use as little hosing as possible for the best vacuum. The blowers were being wired during our installation by their local electrician. Ziptie your air, control, and power cables together. The Zipties should be placed every 12-18″. 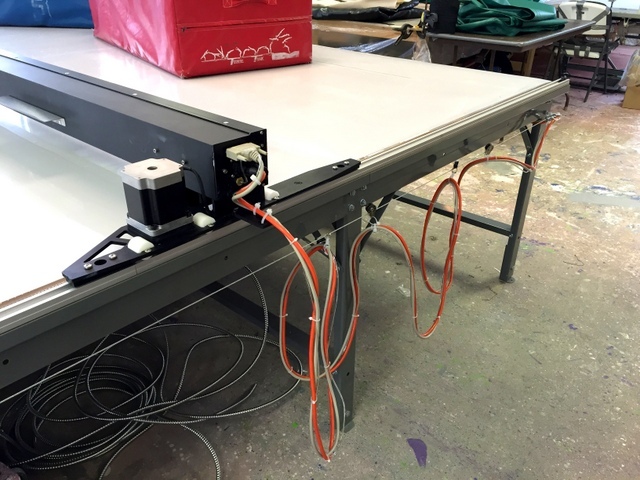 For tables less than 24′ long you can run your overhead-cable-management-system off the side of the table. A turnbuckle on one end is an easy way to tension the cable. Attach your cables to the sailing-grade pulleys with a slight drape. Use a pulley every 3-5′. 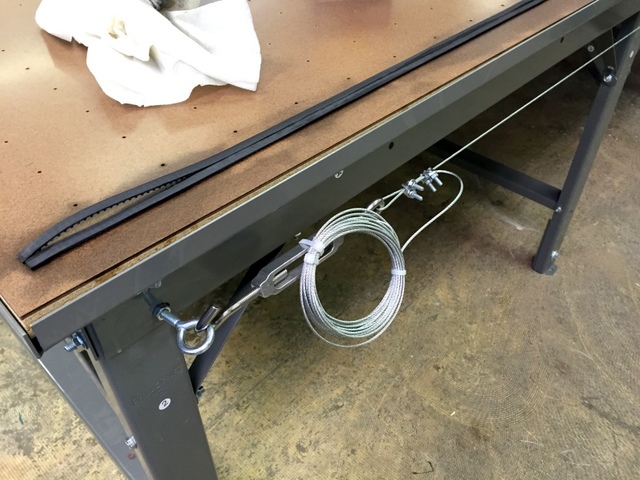 Secure the cables at the end of the table and then run them toward the operator’s workstation. Install track side A. Set the track as straight as possible. 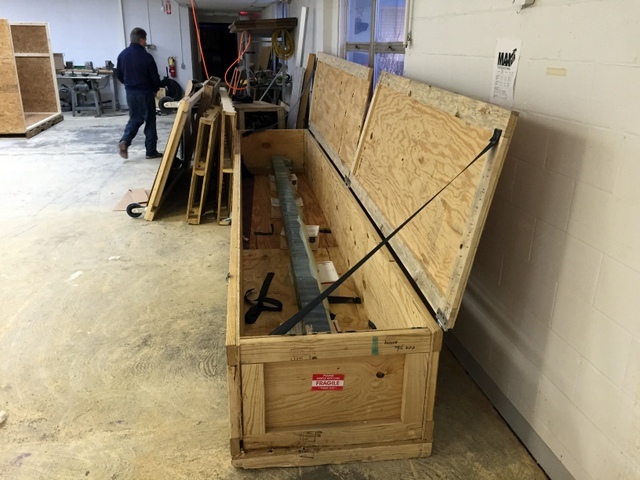 Time to unpack the Plotter/Cutter from its custom crate. 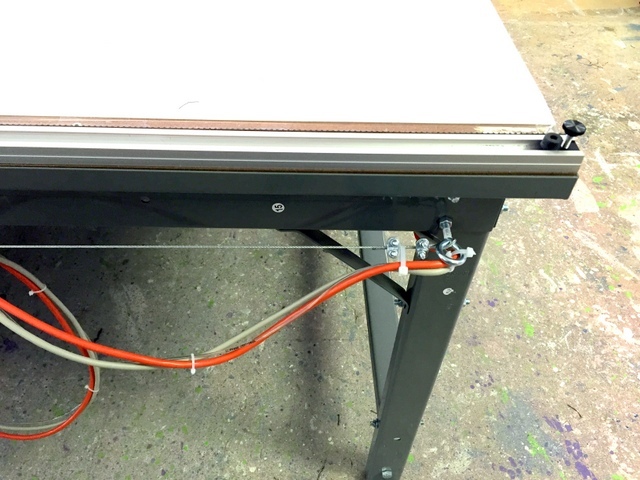 The Plotter/Cutter will be used as a jig to set side B. Prepare the track belt by thoroughly rubbing the backside with acetone. This will help it attach to your track with double-sided tape. 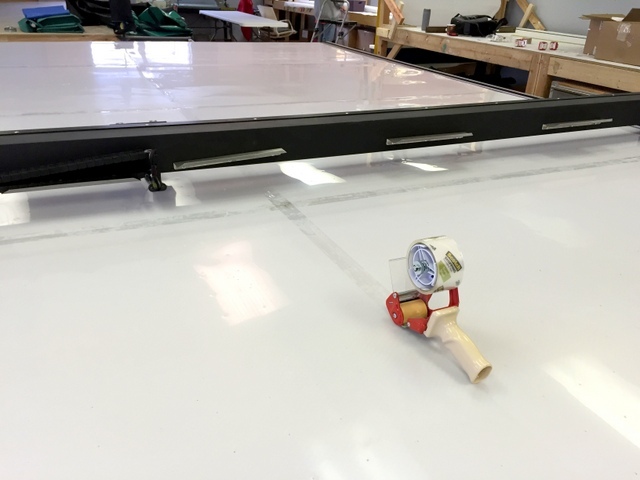 Gently set the Plotter/Cutter on the track and attach the Trolleys and load wheels. Tighten the load wheels so that they no longer spin freely. Attach side B. 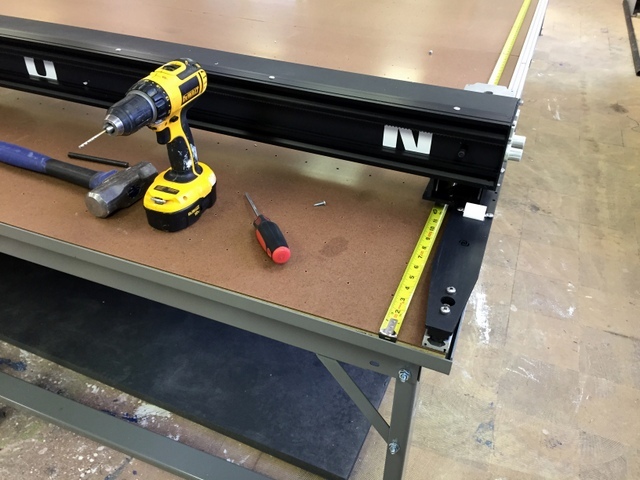 A tape measure set on each side of the table will help you keep the system square during installation. Work the Plotter/Cutter down the table, drilling and screwing as you go. 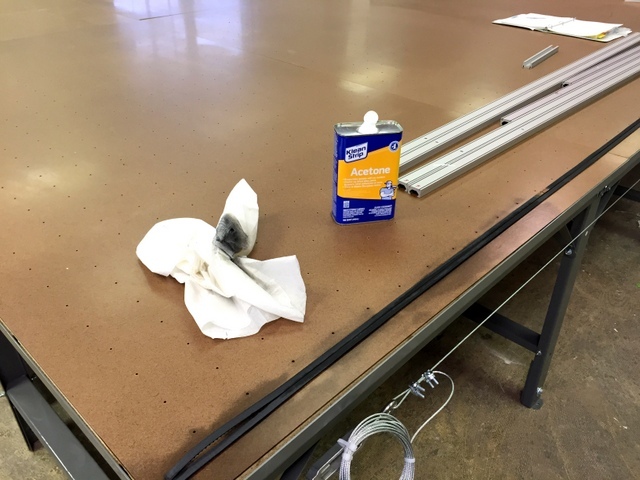 Cover the table in mesh and place the cutting surface on the table. Tape the seams with clear packing tape. 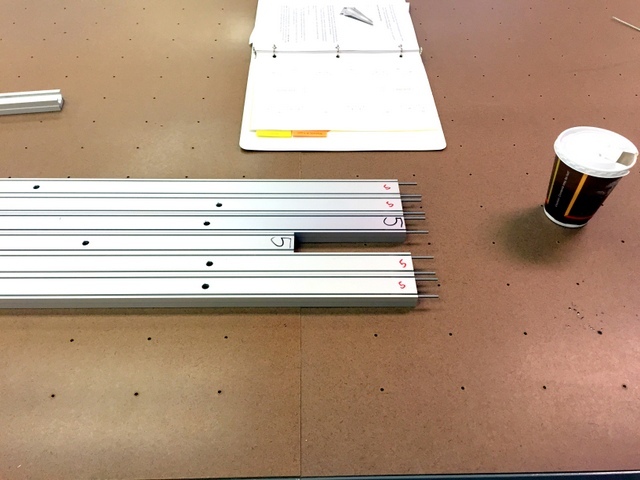 Place a marker in the pen holder and draw alignment marks on the table with the Plotter/Cutter. Great job! 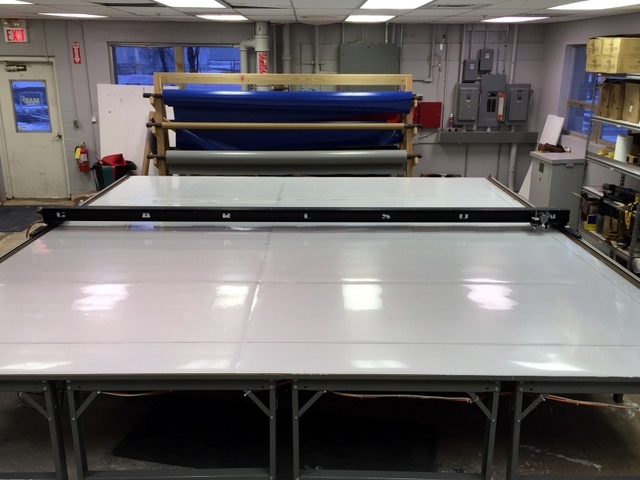 You are ready to start training on your ultra-wide Carlson cutting system. Begin by calibrating and squaring the machine. Training Steve and Paul to cut real jobs. Here’s a video demonstration of our soft home. The origin of every plot/cut is where ever the pen is located. This allows the operator to start a cut from anywhere on the table. Home-made roll rack to be improved. Last glamour shot — Cutting and Plotting with our multi-tool low profile head. We would like to give a big thanks to Paul, Steve, Jeff, and Donna for a fantastic installation. Thank for showing us a great time in Grand Rapids, MI. We look forward to seeing your future success.